I desperately needed another chocolate fix this week (let me add that I started feeding my weekly chocolate habit, this past Monday at Levana Kirschenbaum‘s with some of her fabulous Chocolate Truffles; I continued with Easy Chocolate Squares), therefore I had no choice but to turn to François Payard‘s Chocolate Epiphany. Leafing through the pages, to my surprised delight, I came across an interesting dessert which I just had to try; as usual, Pâtissier Payard did not disappoint! Sprinkle the gelatin over 2 tbsp of the whole milk, and let stand for 3 to 5 minutes. Put the chocolate in a medium bowl. Combine the cocoa powderand the sugar. Put the remaining milk and sugar mixture in a small saucepan over medium high heat, and bring almost to a boil. Whisk the gelatin into the milk, then pour the milk ovrer the chocolate. Whisk the gelatin into the milk, then pour the milk over the chocolate. Whisk until the chocolate is melted and the mixture is smooth. Strain the mixture through a fine-mesh sieve into a a small pitcher or a bowl with a spout, and set it aside to cool to room temperature. Sprinkle the gelatin over 2 tablespoonsof the milk, and let stand for 3 to 5 minutes. Combine the remaining milk and the coffe, vanilla bean, and sugar in a medium saucepan over medium-high heat, and bring almost to a boil. Whisk the gelatin into a mixture until combined. Strain the mixture through a fine-mesh sieve into a small pitcher or a a bowl with a spout, and set it aside to cool to room temperature. If using vanilla extract instead of a vanilla bean, whisk it in it now. Pour some of the chocolate mixture into six tall, clear 4-ounce glasses, so that it fills up about one fourth of each glass. Place the glasses in the freezer to set the panna cotta, but do not let it freeze solid. This will take about 30 minutes. Then pour some coffee mixture over the chocolate one, to fill the glasses halfway. Return the glasses to the freezer to let the coffee panna coota set, about 30 minutes. Repeat the process with one more layer each of chocolate and coffee. The last layer does not need to be put in the freezer. Refrigerate the glasses until the panna cotta layers are set, about the 30 minutes, or overnight. To serve, garnish with a dollop of apricot preserves. Of all the foods we eat, fruits are the most beautiful; since biblical times they symbolized the bountifulness, the riches of the land. Fruits are refreshing and healthy as a snack or as the end of a hearty meal. Pour enough water into a large pan to cover the first batch of fruit. Add the cinnamon, stick, cloves, lemon juice, and one tablespoon sugar (taste after the fruit has been poached and adjust as necessary). Bring to a boil over high heat and and add the the peaches, reduce the heat and simmer – depending on the ripeness – for 2 to 5 minutes,, until just tender. Using a slotted spoon, gently transfer the peach slices into a large bowl, draining as much of the liquid as possible against the side of the pan. Add the nectarines to the pan and cook same as the peaches. Transfer to the bowl. Cook the apricots the same way, then the cherries, adding to the bowl as they become tender; do not overcook since the fruit continues to cook in the bowl. Add more water to the pan if necessary. Stir in the berries and swirl gently just to cover with the liquid.Simmer for 1 minute. Remove the berries to the bowl and taste the syrup in the pan. adjust the sweetness to taste. If the syrup is too thin, increase the heat and boil until thickened and reduced. Pour over the fruit, let it come to room temperature and refrigerate over night. You’ll find it thoroughly refreshing and delicious. Summer is fast approaching, so what could be better than this recipe adapted (by Kosher Revolution‘s author Geila Hocherman) from Dede Wilson‘s Unforgettable Desserts? For the poached nectarines – Stir together the wine, water, and sugar in a narrow , deep saucepan and bring to a simmer over medium heat, stirring occasionally, until the sugar dissolves. Add the fruit; the liquid should cover the fruit. Simmer just until the fruit is tender when pierced with a knife tip, 8 to 10 minutes. Remove the poached fruit from the liquid with a slotted spoon and set aside on a cutting board. Measure out 1 cup of the poaching liquid and set aside. Boil any remaining poaching liquid until it reduces and becomes thick and syrupy. Cool and then pour into an airtight container. Once the fruit is cool, chop into 1/2-inch dice, discarding the pits. Scrape the fruit into the container with the syrup. Refrigerate until chilled or for up to 3 days. For the granité – Stir together the wine and the 1 cup reserved poaching liquid in a 8-inchmetal baking pan. Cover the pan tightly with plastic wrap. Freeze until solid or for up to 3 days. For the sabayon – Whisk the egg yolks and wine together in the top of a double boiler (or deep bowl for a makeshift double boiler). Whisk in the sugar. Set over boiling water that just touches the bottom of the bowl and whisk constantly until very thick and almost tripled in volume. The mixture should form a ribbon when you lift the whisk; this will take 5 to 8 minutes. Remove from the heat and immediately set over a bowl of ice water. Whisk the mixture until it is completely cool. Whip the HeathyTop in a separate clean bowl until soft peaks form, add the unflavored gelatin (diluted in the water) and then fold into the egg mixture. Scrape into an airtight container and freeze until solid or for up to 3 days. For the assembly – Have 6 to 8 clear wine goblets available. Right before serving, scoop a layer of fruit into the bottom of the glasses. Top with a scoop of sabayon. Use a fork to make course, icy flakes of granité and scoop them onto the sabayon. Repeat the layers, ending with the granité, and serve immediately. Delicious snack, perfect at any time. Enjoy, gentle reader, enjoy! A well known New York Chef once told me that when he graduated from the Culinary Institute of America, he prided himself of making a pasta dish that required thirty ingredients. Sure, it was absolutely delicious, but it took a loooong time to prepare. Soon, however, he outgrew that urge as he realized you can still make delicious dishes with far fewer ingredients, less preparation time and those tasting them would still lick their fingers. 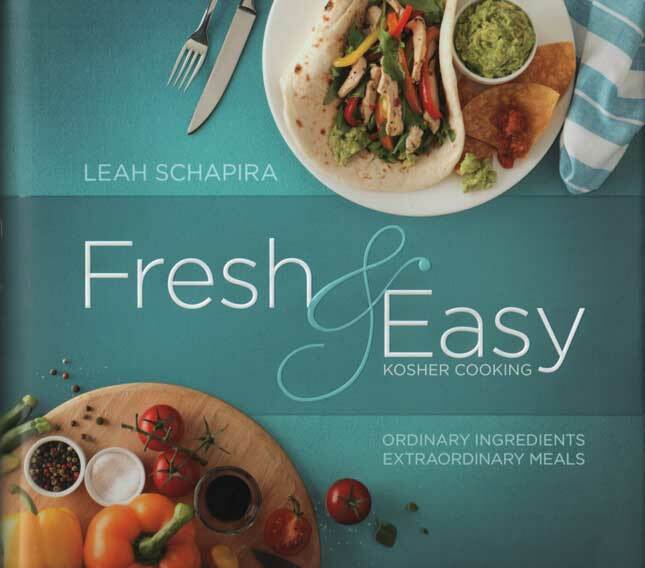 Leah Schapira‘s Fresh and Easy follows the latter philosophy, as the book makes food preparation fun, healthy, quick! Each of these subsections sports tempting thumbnail photos of various dishes and the page numbers where they can be found. In a mixer, whip the egg whites until stiff peaks form. Over a double boiler, melt the chocolatre with the coffee. Beat the egg yolks with a fork and quickly add to double boiler, mixing well. Add the red wine. Remove from heat. Fold in the egg whites until combined. Place in individual cups for serving refrigerate. To prepare pear chips, preheat oven to 325F. Thinly slice the pears and lighly coat each side with sugar. Place the pear slices in a single layer on a baking sheet lined with parchment paper. Bake for 15-20 minutes. Turn the pears over and bake for an additional 15-20 minutes. Turn off the oven and leave the pears in the oven to cool and dry. 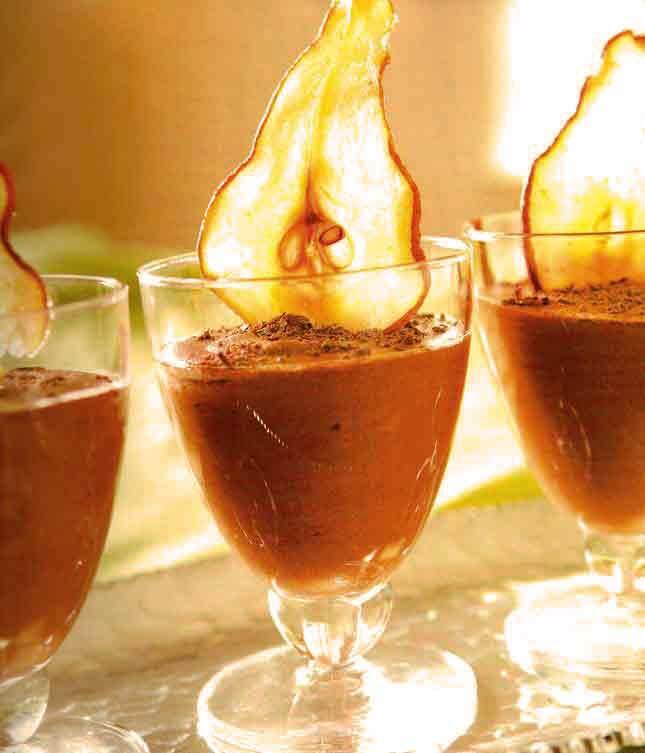 Before serving, garnish mousse with chocolate shavings and caramelized pear chips. 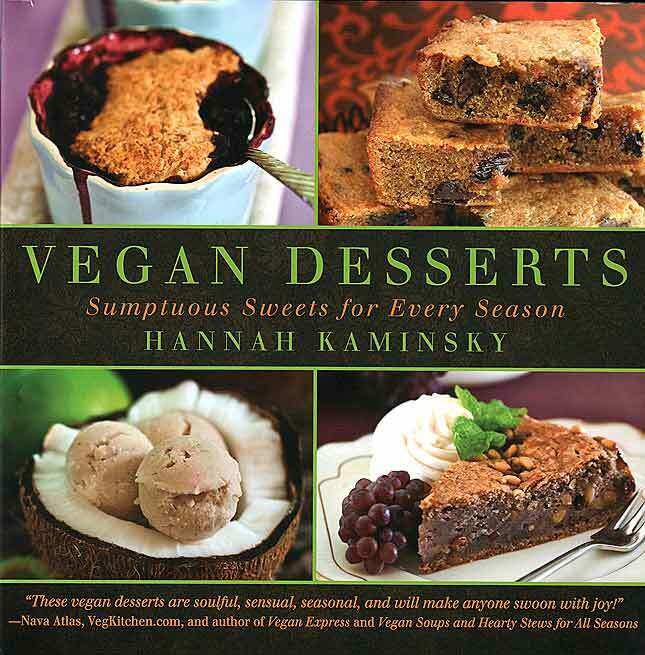 Vegan Desserts – Healthy, Delicious! Talented, great photographer, passionate baker, all these refer to Hannah Kaminsky and every single one is an understatement when referring to the very young Hanna Kaminsky. There’s no question about it – food made with ingredients at their prime and in season tastes best. Deceptively simple in concept, but remarkably more complicated than most would like to admit, there’s so much more to take into consideration than just the range of produce available at the nearest grocery store…. [..]Irresistible recipes are about more than fresh fruit – food always tastes better when made with joy, care, and just a pinch of good humor. A few months ago I had the pleasure of meeting Ms. Kaminsky, at a photo shoot where she served as the food stylist. At the time it was obvious she had a photographer’s eye for color, shape, positioning. When I picked up her book it became obvious that, though very young, she has also mastered the subtle nuances of flavors and their interaction. The book is beautifully laid out, with the recipe pages matching or contrasting the colors of the accompanying photos. With sections like Ingredients Summary, Kitchen Tools and Toys, Troubleshooting, Components and Accompaniments, Food Allergy Index, most of the recipes are divided by season, here’s one from the Summer section that’s sure to become a favorite. Roasting fruits and toasting nuts intensifies their flavors, allowing their unique characteristics to shine through, even mixed into a chilly application that can otherwise dull flavors. 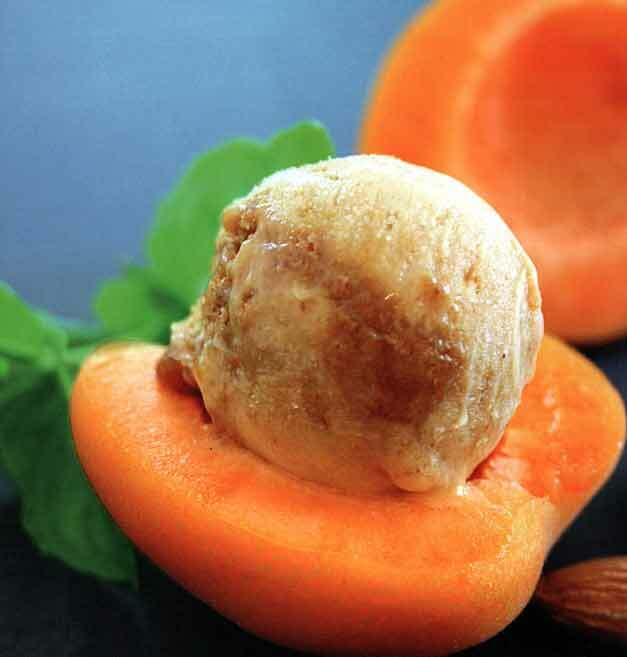 If you are in a hurry or can’t wait to tame your ice cream appetite, you could leave the apricots as they are and substitute 1 cup of almond butter for the praline ripple, but in my opinion the incredible caramel essence you’ll get with this recipe as written is more than worth the extra effort. First, you’ll want to make the almond praline ripple. Start by combining the sugar, water and salt into a small saucepan and placing it on the stove over medium heat. Cook the mixture for 10-12 minutes until it caramelizes and turns a deep amber color. Quickly stir in the almonds to coat and pour everything into a Silpat. Let it cook completely before breaking it into pieces and processing it into a smooth paste. Drizzle in the oil, and it should become the consistency of somewhat runny peanut butter. Cover and let rest in the fridge while you make the ice cream. Preheat the oven to 400 F and lightly grease a sheet pan. Wash and thoroughly dry the apricots before cutting them in half and removing the pits. Place the halves with the cut sides up on your prepared pan, and drizzle them all with the oil. Roast them for about 20 minutes, until they are so tender they can barely hold themselves together anymore. Let the apricots cool a bit before scooping them all into your food processor and pureeing them. Once smooth, add in the coconut milk, sugar, vanilla, and amaretto processing to combine. Chill the mixture thoroughly in your fridge before freezing it in your ice cream maker per the manufacturer’s directions. After freezing in the machine, pour the ice cream out into a plastic tub and drizzle the almond praline paste on top. Use a spatula to marble it in, cover, and quickly move it into your freezer so it can solidify. Even the most cursory flipping through the pages soon makes it all too apparent that Ms. Kaminsky indeed authored this book with joy, care and more than just a dash of love. Enjoy, gentle reader, enjoy! My mother (a"h) used to make something very similar... ahh, the memories! Beat the butter in a medium bowl with an electric mixer on medium-high until smooth. Add the sugar and salt and continue to beat until evenly combined. Scrape down the sides of the bowl, then beat in the egg yolk. Add half of the flour, beating until just crumbly. Scrape down the bowl again; add the remaining flour and then the sour cream or yogurt, beating just until the dough is evenly moistened. Turn dough onto a lightly floured work surface and knead lightly to bring it together. Roll the dough between 2 generously floured sheets of waxed or parchment paper into a circle about 1/4-inch thick with a rolling pin. Refrigerate for 1 hour. Cut out 6 (4 1/2-inch) rounds using an inverted bowl or round cookie cutter. Place rounds in the muffin tins and, using a small shot glass or your fingers, press into the corners and about halfway up the sides for a snug fit (see photo). Freeze dough in the muffin tin for 30 minutes. Position a rack in the lower third of the oven and preheat to 325 degrees F. Spray the outside of 6 standard muffin liners with cooking spray and place in the crusts. Fill with dried beans or pie weights. Bake crusts until just brown around the edges, about 25 to 30 minutes. Remove from the oven and cool for about 1 minute; then carefully remove the muffin liners and baking beans. Return pan to the oven and continue to bake until crusts are cooked through and evenly browned (see photo), about 15 to 20 minutes more. Cool slightly. Then carefully remove crusts from the muffin tin and cool completely on a rack. Strain through a fine mesh strainer into a bowl. Whisk in the butter a little at a time, until smooth. Stir occasionally until cooled. (Setting the bowl in a larger bowl of ice will speed this up.). Fill each tartlet with 1 1/2 tablespoons of the cool lemon filling. Bring a few inches of water to a boil in a saucepan that can hold a standing mixer’s bowl above the water. Whisk together the egg whites, sugar, cream of tartar and salt in the bowl by hand. Set the bowl above the boiling water and continue whisking until the mixture is hot to the touch (135 degrees F) and the sugar dissolves, about 1 to 2 minutes. Transfer the bowl to the mixer fitted with the whisk attachment and beat the whites at medium-high speed until they hold soft peaks. Increase speed to high and continue to beat to make a stiff, cool meringue, about 10 minutes. Dollop or pipe on top of the filling. Just before serving, preheat the broiler to high. Set the pies on a baking sheet, and place under the broiler until the meringue is evenly toasted, about 2 minutes. (Alternatively, brown meringue with a blowtorch.) Serve immediately or refrigerate until ready to serve. – The crusts can be made, baked and frozen up to 2 weeks. – The curd can be made up to 3 days in advance and refrigerated. – The meringue can be made up to 1 day in advance and refrigerated. Preheat the oven to 300 degrees F and arrange four ramekins in a rimmed baking dish. Combine the cream, maple syrup, and salt in a small saucepan. Heat until it comes to a simmer. In a medium bowl, whisk together the egg yolks and vanilla extract. Using a small ladle, add some hot cream to the egg yolks a few tablespoons at a time. Whisk the egg yolks into the cream in the saucepan until combined. Strain the mixture through a fine sieve. Elissa, the blog’s author, is a very good photographer with an obvious love of baking. It was her photography that seduced my senses into imagining the taste and just try it. I was not disappointed. Enjoy, gentle reader, enjoy! Winter’s come and gone, spring with its sometimes uncertain weather is about to leave us. It may not be technically summer yet, but summer temperatures are already here. Not only do we enjoy summer type drinks, but even desserts take on new flavors. This time of the year is perfect for marshmallows roasted over a camp fire, or any other way; I just tried Elyon Marshmallows and Elyon Mini Marshmallows and found them outstanding! Over a low flame, combine sugars, corn syrup, vanilla, salt, and margarine in a pan. Stir constantly as mixture blends, continue stirring for an additional 2 minutes as the mixture starts gently bubbling. Turn off flame. Add pecans and honey graham pieces into mixture stir until these are fully covered by the caramel. Grease the two 9″ pans and spread mix evenly into each of them. Spread half of Elyon’s Mini Marshmallow evenly into one pan and the other half into the second pan. Distribute white chocolate chips and dark chocolate chips into decorative patterns on top, for each 9″ pan. Preheat oven to 350F and bake for 10 minutes or until each pan’s contents shows a light beige color. Cool at room temperature and cut into 1″ squares. Refrigerate and serve. ...more s'mores, more s'mores... they didn't last too long! Enjoy it folks, it’s easy to prepare and tastes delicious!